And usually we dig deep using tools like Dynatrace to analyze the performance (or the lack of). What we usually forget is that behind all these web services, database calls etc… is just a lot of Java code. We all now how to achieve high performance on an architectural level, but what if we go a level lower ? What’s the fastest way to do for-loops ? 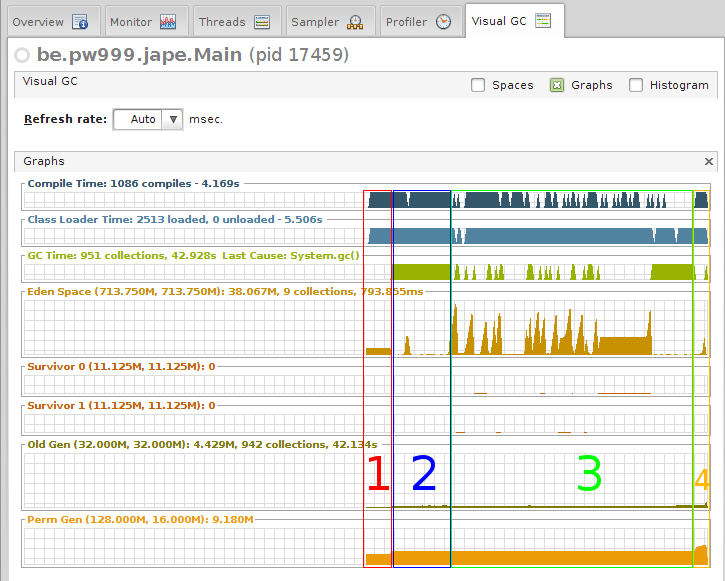 Which Java Collection is the fastest ? Nobody seems to know 😯 . 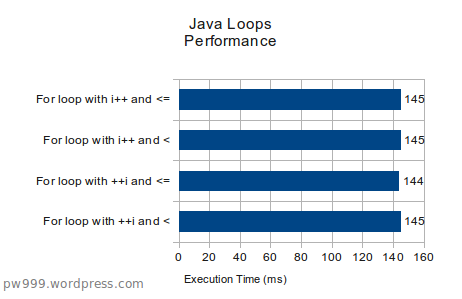 That’s why I wrote JaPe, a simple Java Performance benchmark. 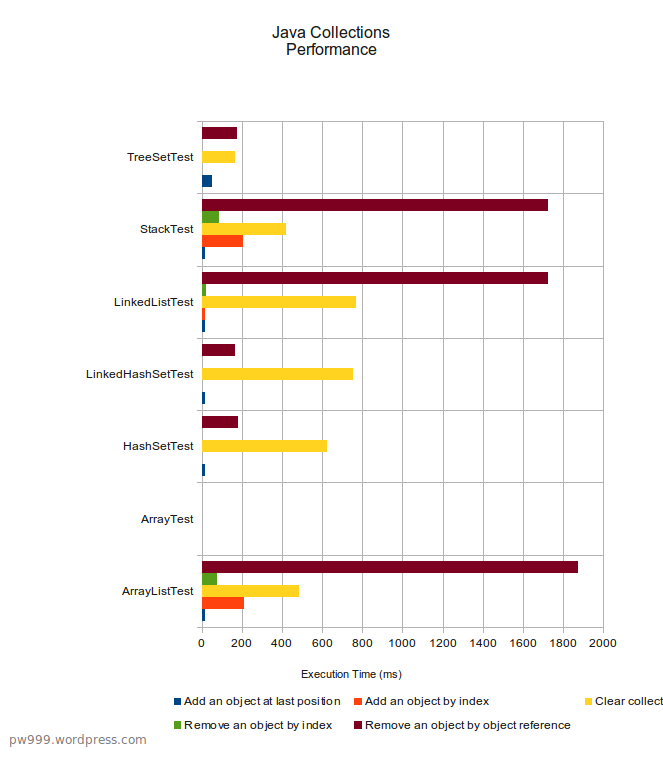 It’s a simple Java benchmark program I wrote to test some commonly used implementation of java.util.Collection, java.util.Map and some other common things like String concatenation and the differences between primitives and their object counterparts. 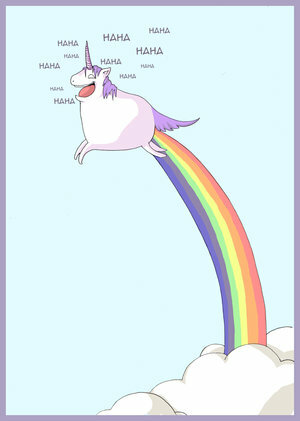 An hour of coding I thought, I couldn’t be more wrong (ps. if you’re just interested in results and answers, then scroll down to 1/4 of this post). While writing this little benchmark I encountered several pitfalls which would either have a positive or negative influence, rendering the results and my benchmark useless. One of the great aspects of Java is that you don’t have to clean up; the Garbage Collector will make sure that all non-referenced objects are removed from memory sooner or later. The downside is that you, as a developer, have nearly no control over this garbage collector, it will run when it has to and nothing will prevent it from running while JaPe is performing it’s tests. 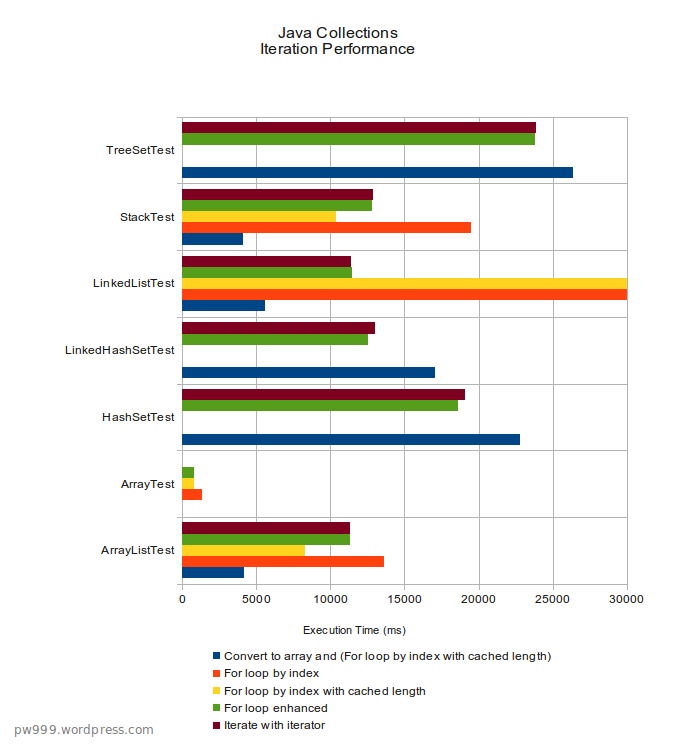 I decided that this is not a bad thing, since garbage collection is a part of the Java platform and trying to exclude it from the benchmarks would be like cheating. After each test (and sometimes even more often) I would call the GC myself to make sure that each test starts with a clean heap. The survivor spaces and old generation are kept extremely small since no data is persisted and promotion to tenured is nearly non-existent during the benchmark. 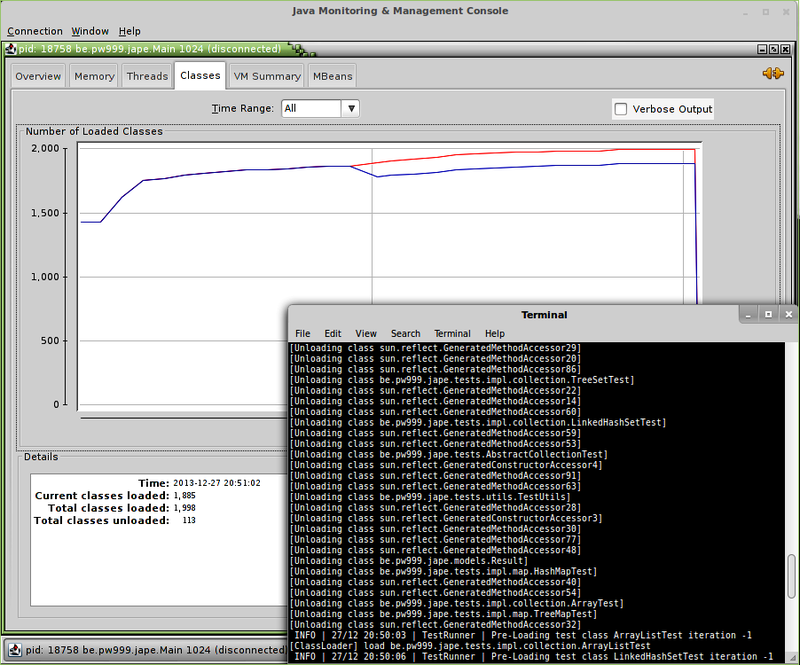 The following screenshot shows the memory usage of the JaPe benchmark. 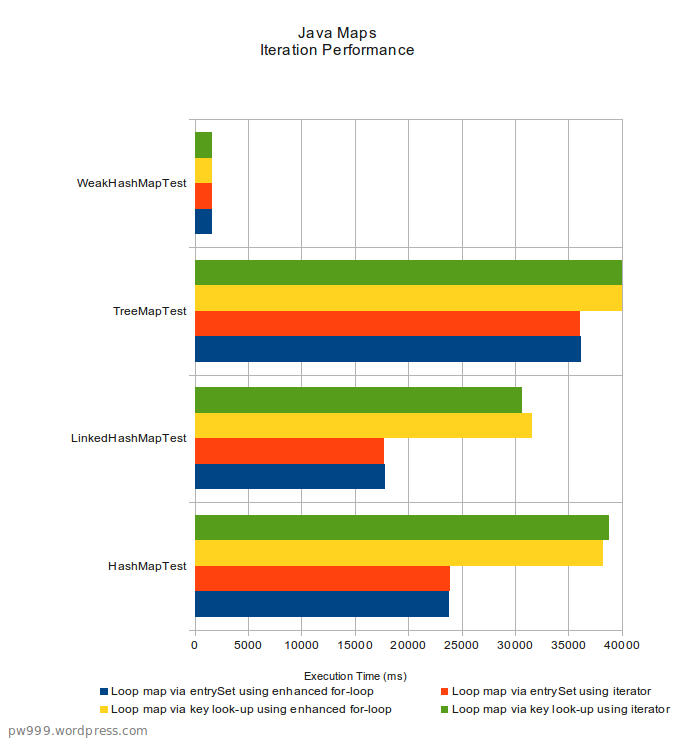 During the complete lifecycle of the benchmark, almost no data is kept in-memory. The 42 seconds of Garbage Collection are mostly due to explicit calls to System.gc() which happen outside the tests and have no influence on the results. In my first attempt I used System.nanoTime() to measure the time needed to execute each test-method, and I would use this 100.000 times. I quickly discovered that this method is not very precise and calling it this many times introduced at least some degree of error in my results. 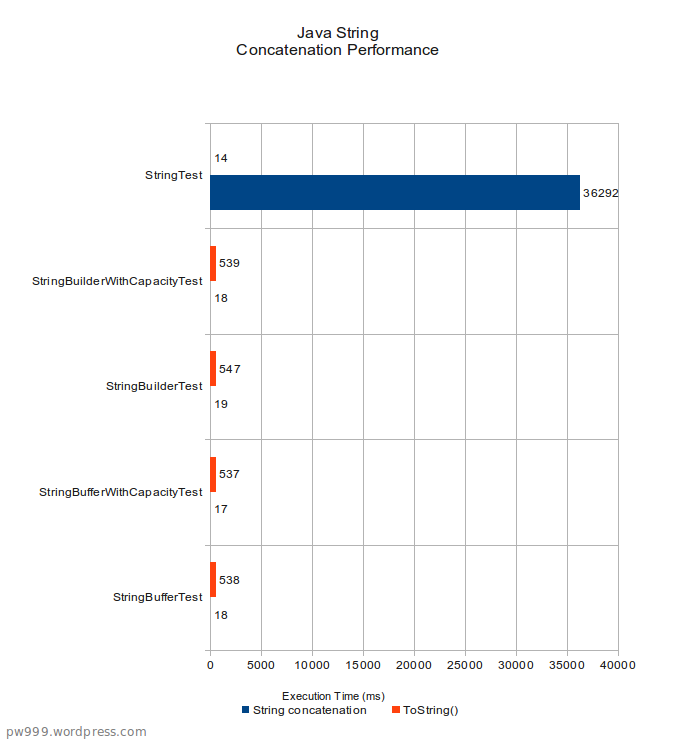 When running the following snippet before each test, I got averages between 1500 ns and 2500ns ! Repeating this 100.000 give me a random offset between 0 and 100ms which is huge on a test that would only take 40ms to complete it’s 100.000 iterations. After discovering the limitations of the nanosecond, I decided to measure the total execution time in milliseconds of each test-method . This way I would also measure the time needed to process the for-loop, but this offset is the same for each test and can thus be ignored. In order to improve the accuracy, I also repeated certain operations 40 times to make sure the total time would at least exceed 1ms. 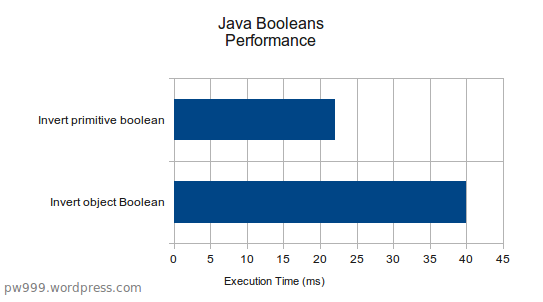 This was probably one of the more difficult issues and solving it involved writing a custom ClassLoader; Java seems to optimize itself at runtime and somehow it managed to make the same Boolean-test run 10-100x faster during the JVM’s lifetime ! Turns out you can bypass this behavior by unloading the test-classes. To make sure this happens, all classes in the be.pw999.jape package are loaded and cached in a separate classloader, while all other classes are loaded using the sun.misc.Launcher$AppClassLoader. Once all tests are finished, the classloader’s cache is cleared, all remaining objects are nullified and a call to System.gc() is all that’s left to unload all classes and the JVM is ready again to re-run each test with a different initial size. For the subjects I wanted to test, a test-class was created. Such test-class is an implementations of the ITest interface and a good example would be the AbstractCollectionTest . Each test-class has several test-methods and each test-method is invoked 100.000 times. 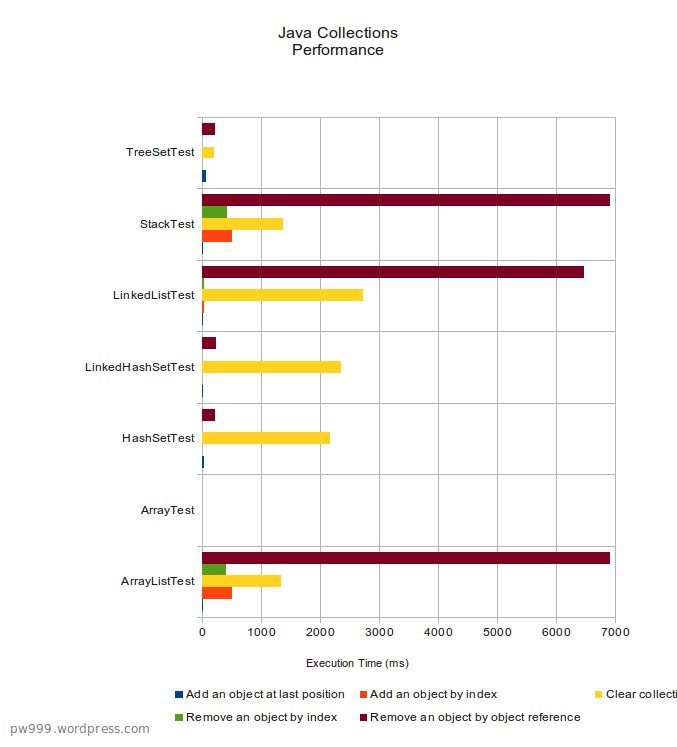 The total execution to invoke each test-method 100.000 will be recorded and this is the value shown in the charts. During the initialization phase, object can be initialized with a given size, in the results here-under, these initial sizes were 1024 and 4096. A Collection for example would be initialized to contain 1024 items after which test would be executed against this Collection. During a second iteration, this Collection would be initialized to contain 4096 items. The first thing to notice is how fast arrays are. 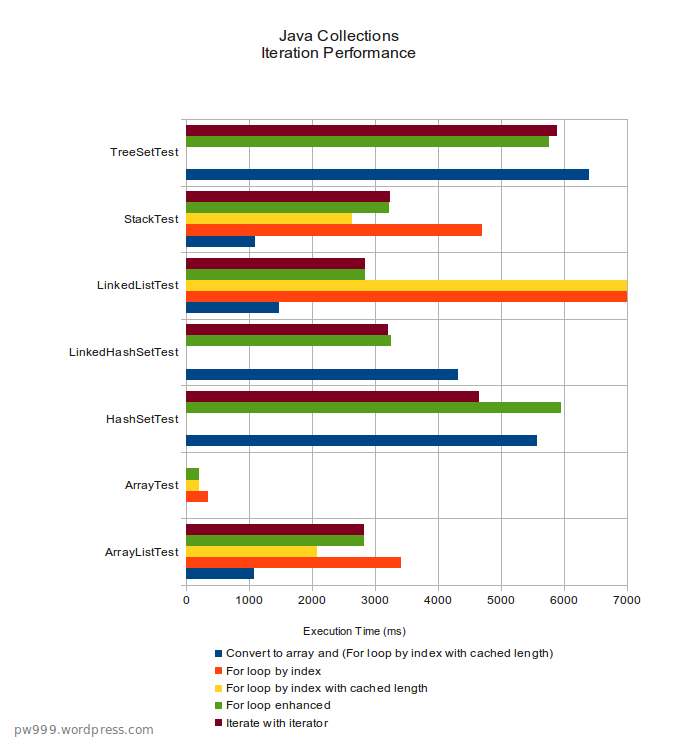 The second thing to notice is how slow the LinkedList implementation is when iterating by index. I would have to multiply the scale by 8 to make it fit on the charts ! 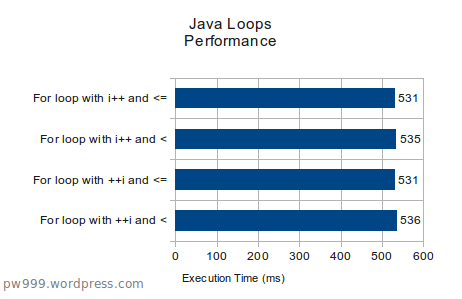 The following chart shows some other, often used, functionalities of java.util.Collection and java.Util.List. 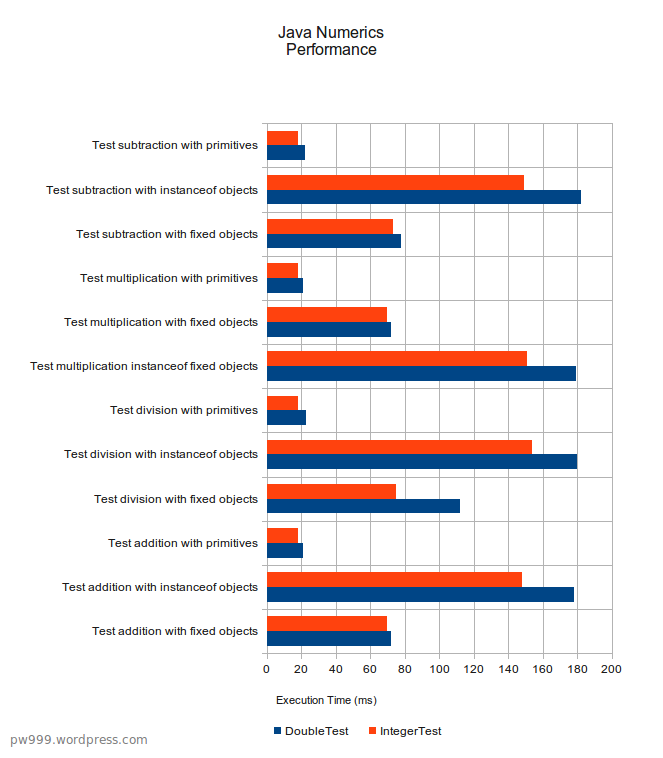 A bit surprising, but not really, is that Sets perform better when removing an object by reference, probably because they’ve already calculated the hashcode of every object in the set. 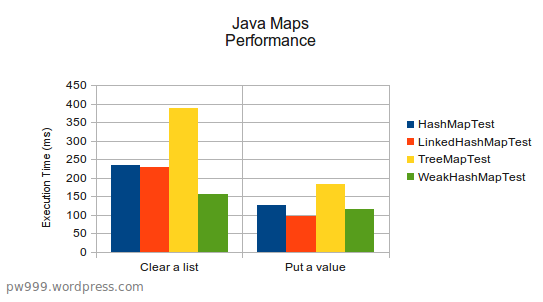 Everybody knows you should iterate a java.util.Map via it’s Entry-Set, but how much slower is it when you don’t ? The following tests were executed on a Map with 1024 and 4096 items. //Loop map via key look-up using iterator"
In general, it doesn’t seem to matter if you use an Iterator or an enhanced for-loop, the differences are small enough to say that both methods are equally fast. 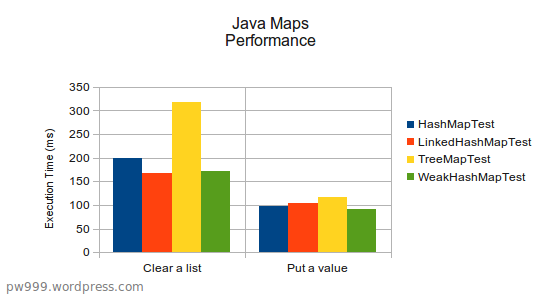 The following chart shows some other, often used, functionalities of java.util.Map. Not much to say here, unless you really bother discussing a difference of 100 milliseconds over 100.000 iterations 😉 . String concatenation is often considered to be slow and preferably done using a StringBuilder or StringBuffer. To test this I concatenated a whitespace character to an existing String and this 100.000 times. Concatenating Strings with the + operator is indeed a lot slower compared to using a StringBuffer or StringBuilder. Doing 100.000 String concatenation with the + operator is roughly 1900 times slower compared to a properly initialized StringBuffer or StringBuilder. The toString() method on the StringBuilder and StringBuffer seem extremely slow, but you have to consider that the time shown in the charts is the time needed to call the toString() method 100.000 times. 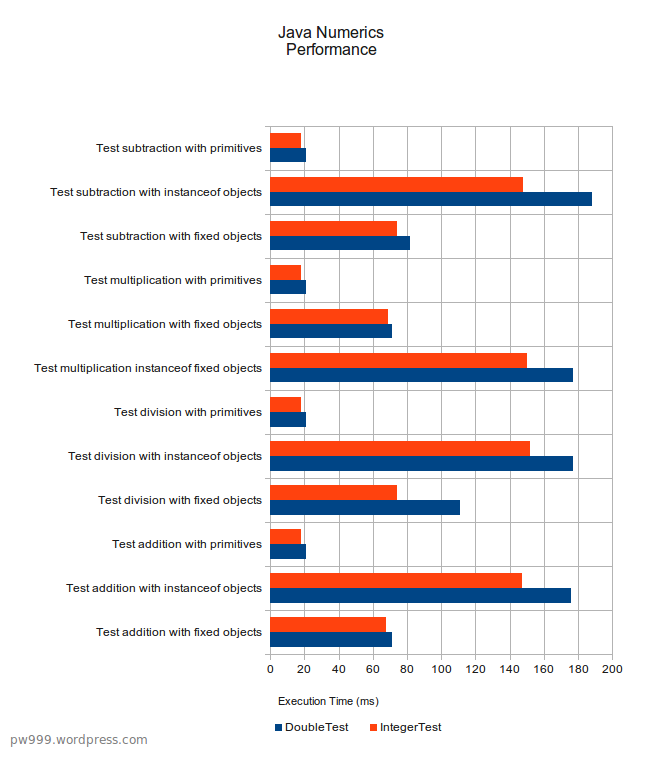 What is faster, Numeric implementations or primitives ? 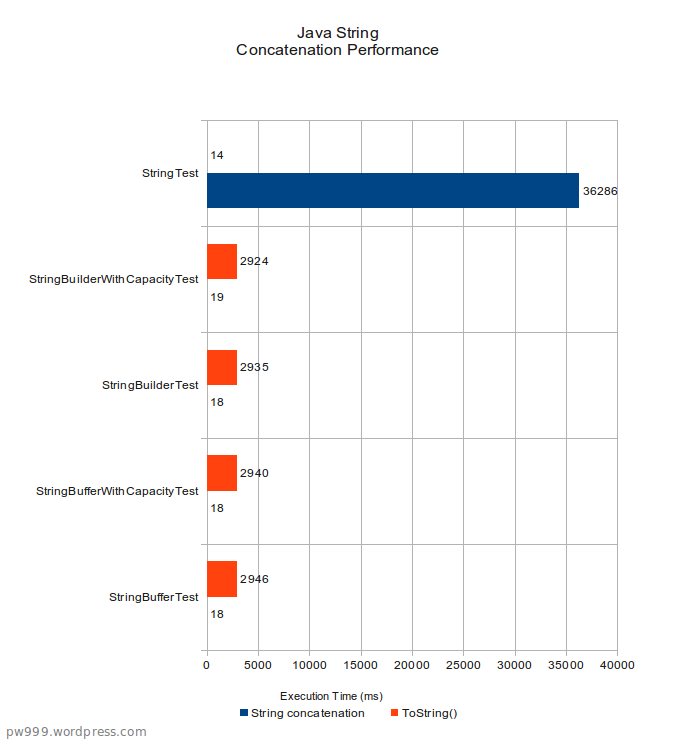 These test are not influenced by the initial capacity (1024 or 4096), but I’m showing both results anyway, just to show that they are nearly identical . 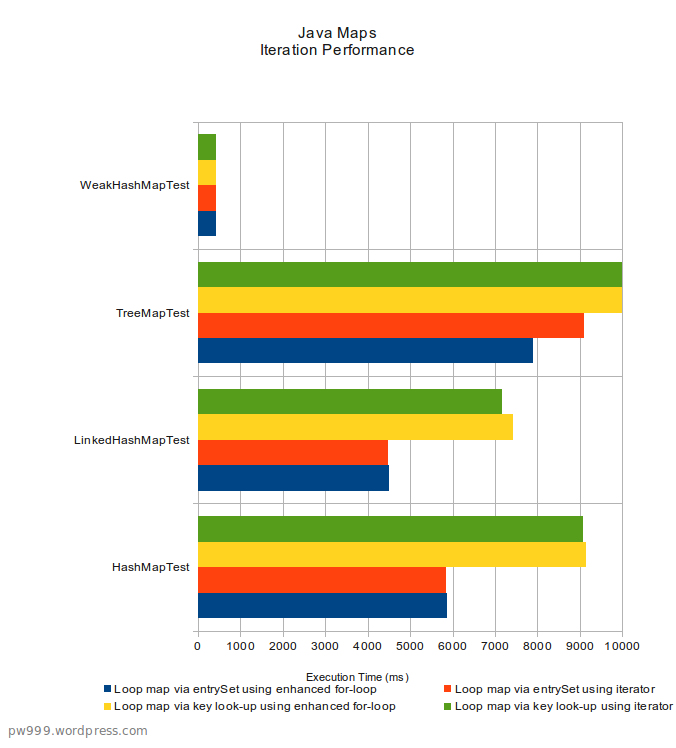 The results are obvious: primitives are a lot faster, even when caching the Numeric object it’s still a lost faster. Calling the instanceOf() method is clearly a lot slower and should be avoided if possible. These test are not influenced by the initial capacity (1024 or 4096), but I’m showing both results anyway, just to show that these are also nearly identical . Pretty neat huh, inverting a Boolean is twice as slow as inverting a boolean. What’s the fastest way to do a for-loop ? The loops will run from 0 to the initial size (1024 or 4096) and this 100.000 times. The complete output can be found on BitBucket. Small disclaimer: I’m not a benchmark/performance ‘expert’/’professional’, I don’t claim to be one either. I’m just a guy who likes developing and JaPe was definitely a good challenge. JaPe is open-source licensed under the Creative Commons Attribution-NonCommercial-NoDerivs 2.0 Belgium License.